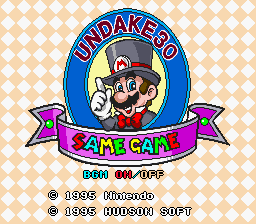 UNDAKE30 Same Game Daisakusen Mario Version (UNDAKE30 鮫亀大作戦 マリオバージョン - literally UNDAKE 30 Shark-Turtle Battle Mario Version) is a Mario puzzle game developed by Hudson Soft that was released in 1995 in Japan for the Super Famicom. The game can be controlled with a standard joypad or the Super Famicom Mouse and is similar to the card game Monte Carlo. The game centers around a large playing field composed of a random arrangement of Mario heads, Coins, Yoshi Eggs, Fire Flowers, and Super Mushrooms. If two or more icons are connected, the player can move the cursor and click to make all the connected icons disappear. Now the icons above fall down and the Player can clear even more icons. Also, there is an undo move that allows the Player to take back the last move, and move back as far as wanted. Once the entire grid is clear, the game ends. Like Mario & Wario, the game was only released in Japan, but is entirely in English. A more standard release was in the form of a Satellaview download, which was broadcasted Mondays at 17:30 (5:30 PM) which was accompanied by an UNDAKE30 Radio show starring Sugiyama Kazuko, the voice of Bomberman. This program aired until 1996. Promotional flyer for an event featuring "Undake30 Same Game" as a prize. The article is has 1996 dates on it, implying that the promotional cartridge was distributed multiple times. Promotional flyer for the Satellaview with a picture from "Undake30 Same Game". This page was last edited on March 18, 2019, at 08:09.